Maharashtra State Board of Secondary and Higher Secondary Education (MSBSHSE) is going to announce the Maharashtra Class 10 Supply results officially on 30th August 2016 (Tuesday) at 1.00 PM. The board has conducted the SSC examinations from 18th July 2016 to 3rd August 2016. 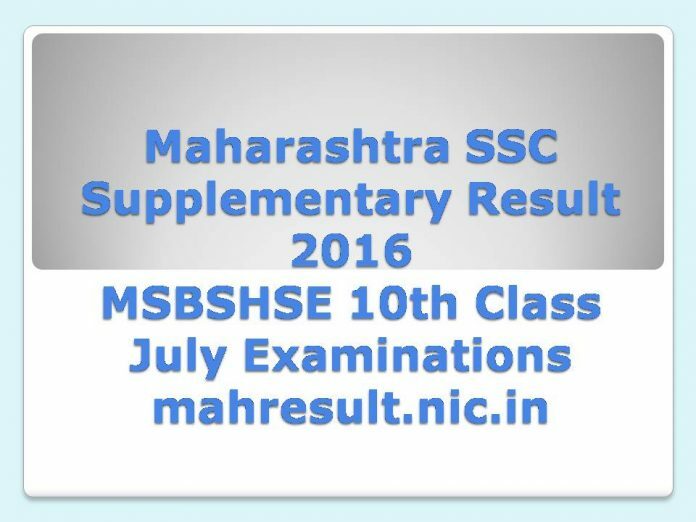 Students can visit the official website mahresult.nic.in to check their Maharashtra SSC Supplementary Result 2016. The MSBSHSE is established on 1st January 1966 under the Maharashtra Secondary Boards Act 1965. The most prominent task of this board is to conduct SSC and HSC examinations in the state of Maharashtra. The board runs the SSC and HSC exams in its nine divisional boards. This year the Class 10 examinations were held in the month of July/August 2016, about 6 lakh students have attended for the SSC Supply July exams. Now the latest announcement from the board is that they are going to declare the Maharashtra SSC Supplementary Result 2016 on 30th August 2016 on their official website. The board is also providing the MSBSHSE Class X Results via SMS and also through MKCL website. The Maharashtra SSC Merit list will also provided along with the Maharashtra Class 10 Supply results. Students who wish to get Answer copies, they can apply from 31st August 2016 to 19th September 2016. After releasing the Maharashtra Class 10 Supply results, who want to apply for rechecking can apply from 31st August to 9th September 2016. The SSC supplementary exam results are declared on the last day of the Special Round 3 for admission to the First Year Junior College (FYJC). The Maharashtra education department is conducting Special 1, 2 and 3 rounds, for the students who will pass the July 2016 Supply exams. As per the board officials, the Special Round 3 ends tomorrow and there is no way, students are not allowed to participate in the admission process even if the results declared tomorrow.